Hiya everyone! Well, last week’s first page seemed to go down smoothly with everyone. Truth be told, Ethan and I were a bit afraid that people would be hesitant to accept an ongoing Axe Cop story from creators other than the Nicolle brothers. Luckily, things went over well and no one groused. That’s good, because we’re in this for the long haul here. Today, we learned that young Axey’s means of dealing with bad guys isn’t too far off from his adult means. Get ready for lots more shocking and sudden violence in this vein… I think shocking and sudden violence will prove to be a hallmark of this story. 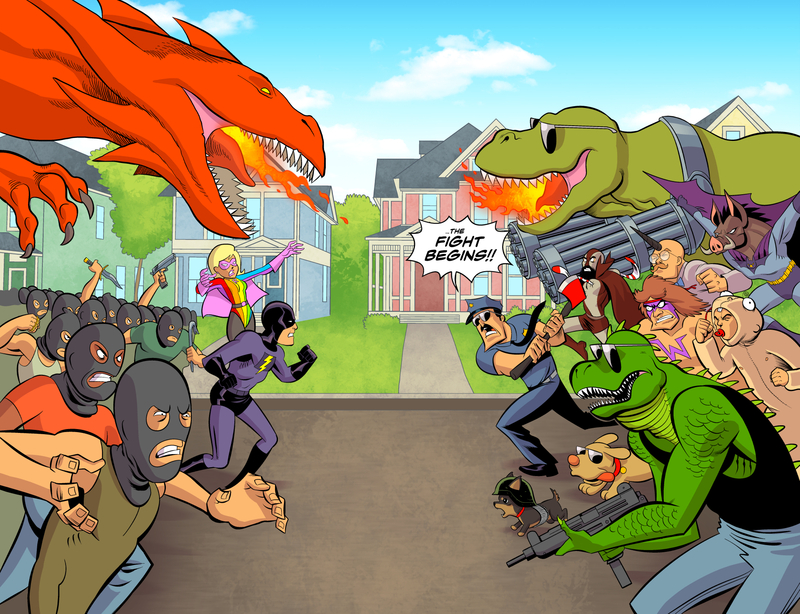 One example in particular is, I think, destined to go down in Axe Cop history as one of his more rash actions against bad guys. Trust him, though. 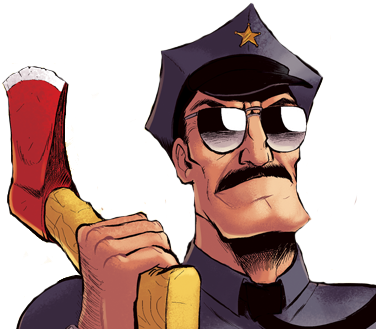 He’s Axe Cop. He knows what he’s doing. If anyone wants to commission some art from me or is just curious to see more of what I do, you can look at my rapidly-becoming-outdated portfolio site, or go to my Facebook page. In recent years I’ve found myself doing a lot of album artwork for metal bands, which is okay, but those guys want an album cover choked with details, and they don’t want to pay for the time it takes to create it. I’ve been hoping to expand into more comics work, so… hit me up if you’ve got a project. Next week, we return to the present day and see what this flashback is leading up to. Also, next week, we finally meet Rainbow Girl herself.